Most savvy diamond shoppers understand the importance of getting a proper diamond certificate, and GIA certified diamonds are the most meticulously evaluated gems in the world. Founded in 1931, the Gemological Institute of America (GIA) is the world's foremost authority on diamond quality. GIA developed the industry standards for grading diamonds, including the essential 4 Cs: cut, clarity, color, and carats. GIA is not a jeweler, however: it is a non-profit research and educational institution dedicated to preserving honesty and integrity in the diamond industry as well as fostering public trust in fine gems and jewelry. More than 1,100 employees in research centers, grading labs, and classrooms throughout the world - including New York, Hong Kong, Tokyo, Moscow, and many more locations - seek to represent the best of the diamond industry through meticulous work and dedication. The GIA has been questioned by the White House and Congress on matters relating to gemology, and a degree from GIA is a prestigious credential. GIA has graded many famous gems, including crown jewels, celebrities' stones, and the revered Hope Diamond. GIA certified diamonds are not necessarily more valuable than other gems, but their quality has been vigorously authenticated, whereas non-certified diamonds may have more questionable origins, and could possibly be conflict or imitation stones. Consumers should note, however, that a quality certificate is not the same as an appraisal: the grading report does not assign any value to the stone, it simply reports in great detail on its quality. Precise measurements, internal and external flaws, color, weight, and other characteristics are rigorously verified through multiple inspections, and an appraiser may use that information when they do assign value to a diamond. Buying GIA certified diamonds can help consumers in several ways. Because the institute's standards are well known and respected, a certified stone's credentials are unlikely to be questioned, and an appraisal will not be suspect. With the certificate, it can be easier to recover the stone if it is lost or stolen, and if at some point the owner wishes to upgrade the diamond jewelry, it will be easier to find a similar stone with comparable characteristics. Furthermore, before ever purchasing a stone, consumers can compare stones of similar quality to judge the best price - because GIA certified diamonds are judged independently and anonymously, it is easy to compare the characteristics of each stone to the jeweler's asking price. With a GIA certificate, it may also be easier to insure a diamond without tedious authentication paperwork. Unfortunately, unscrupulous jewelers may wish to forge certificates in order to impress consumers and pressure them into purchasing a less valuable stone. GIA certificates, however, are highly secure, with microprint lines, holograms, and security screens to make counterfeit certificates easy to identify. Consumers, jewelers, grading specialists, or dealers who suspect misconduct regarding certificates and grading practices are encouraged to report such behavior to help prevent its spread through the industry. The independent firm EthicsPoint is retained by GIA to allow individuals to confidentially report any suspected misconduct. A toll-free hotline (1-866-295-2625) and website are available for this purpose, and both offer multi-lingual support twenty-four hours a day. This partnership demonstrates GIA's serious commitment to insuring quality throughout the industry. 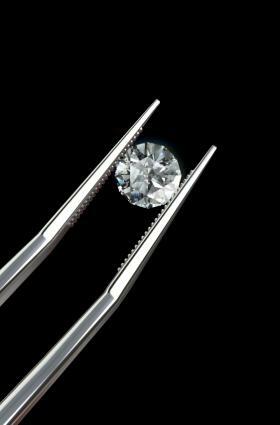 Since GIA does not assign monetary value to the stones it grades, obtaining GIA certified diamonds may not be any more expensive than purchasing non-graded stones. Many jewelers may increase the price of the stones, however, because their quality can easily be verified, and that peace of mind is well worth the price to many educated consumers.